Baseboard Air Deflector Discounts Apply ! Baseboard air deflectors are a great way to prevent valuable warm or cool air from going directly up the drapes. Easily redirect air from vents with this simple to attach air deflector. Baseboard air deflector attaches to steel baseboards with magnets on each side of the deflector. Redirect air from vents with this expandable deflector that adjusts from 15 to 25 inches, accommodating most baseboard registers. 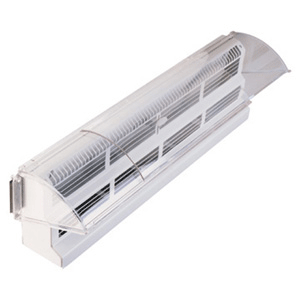 You can use this baseboard air deflector with forced air HVAC systems. our deflectors that redirect air from vents are made of a strong, clear plastic. ***Note: Do not used the deflector on radiant baseboard registers. You can use the baseboard air deflector with the extension sleeve if you need to redirect air from vents that are more than 25 inches in length. Do you need to redirect air from vents that are a different style? We offer many options to suit your needs. Use air deflectors to redirect air from vents throughout your home or office to improve energy efficiency. Place your order today.